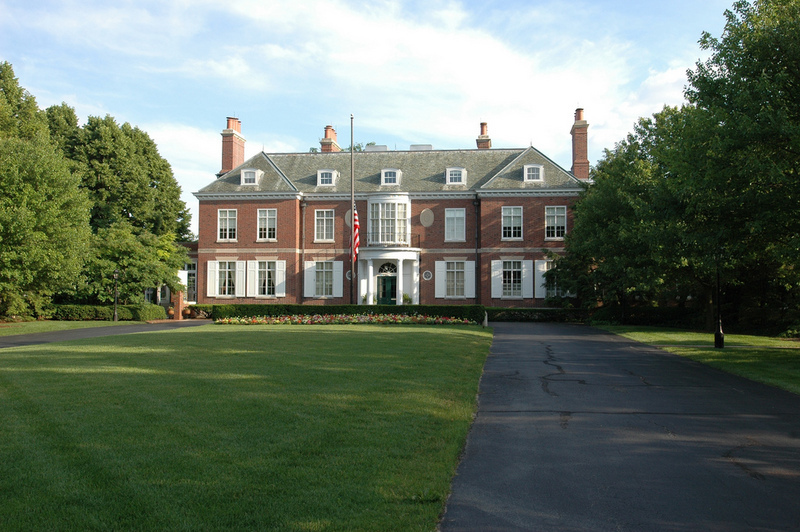 The President's House was designed by architects James M. White and Charles A. Platt. Located in Urbana, the Georgian Revival residence was completed in 1931. 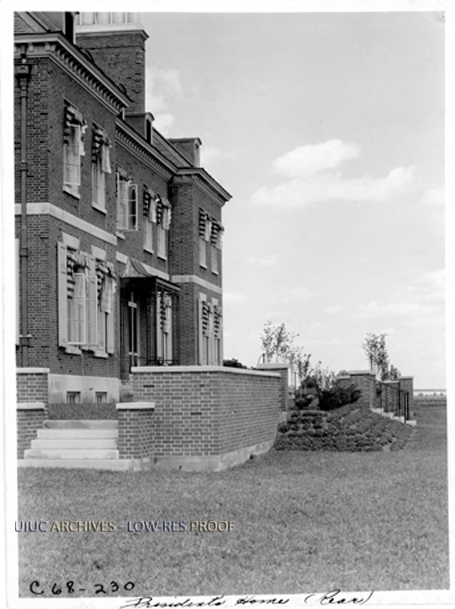 The President’s House was the result of a decree in 1928 by the Board of Trustees of the University of Illinois. This called for a “suitable President’s House...adequate for the probable needs and duties of the President of the University.” This house serves multiple purposes. First, it provides a place of residence for the President of the University. This includes all presidents to date excluding the first 6 that were in their presidential position before the building’s completion. The first President to reside in the President’s house is President Harry Woodburn Chase. On top of being the President’s home, this building also serves as a place to house distinguished guests. Notable guests have included: former first lady Eleanor Roosevelt, actor John Malkovich, movie critic and Illinois alumnus Roger Ebert, and others. The President’s House has hosted over 200,000 guests for meetings, dinners, and receptions among other events. The University of Illinois hired architect Charles A. Platt to design several buildings so that the university would have consistent architectural style. This “Georgian Revival” style of Platt’s architecture can be characterized by the building’s simple 1-2 story box frame with centered panel front doors and rectangular windows. These buildings also often feature a pitched roof and a red brick veneer facade. This style can be seen today when touring the south side of the University’s campus, and the President’s House is no exception. The President’s House is a 4 story building consisting of 3 floors above ground and a single floor basement. The basement includes offices, as well as laundry, recreational, and utility rooms. The first floors consist of a kitchen, dining room, living room, maid’s room, and garage among other rooms. The upper floors have bedrooms and additional offices. Architects James M. White and Charles A. Platt worked on several University of Illinois buildings. Charles A. Platt (1861-1933) is an architect from New York City who came to architecture through a background in etching, painting, and landscape design. His works at the University of Illinois are primarily concentrated on the south side of campus, resulting in the Georgian Revival style of architecture that can be seen at the university today. 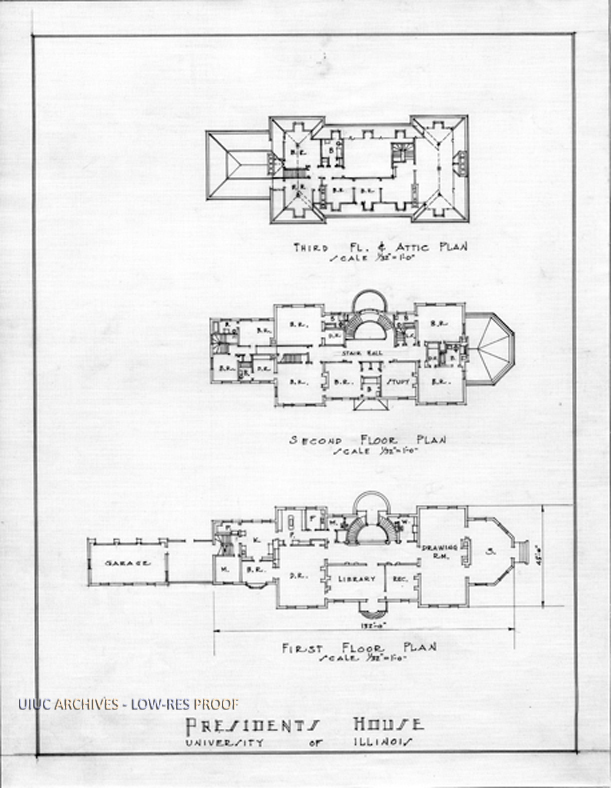 President's House progress plan, page 3, ca. 1932: Image courtesy University of Illinois Archives. If you can help to identify the copyright holder, please contact the University Archives. 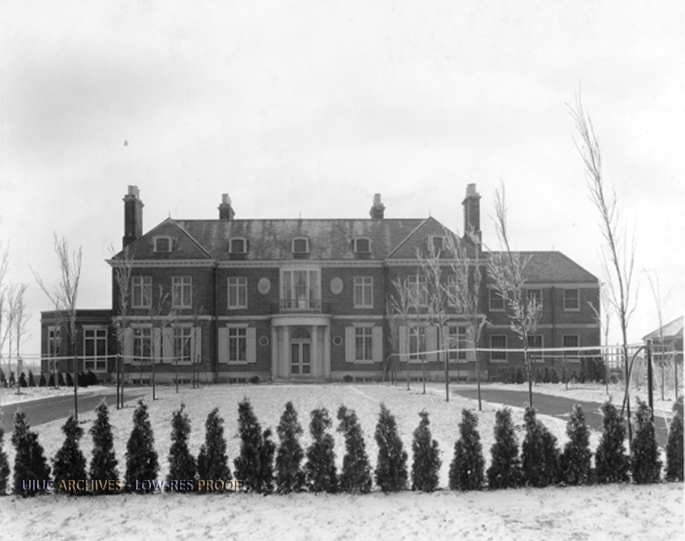 President's House, 1932: Image courtesy University of Illinois Archives. If you can help to identify the copyright holder, please contact the University Archives. 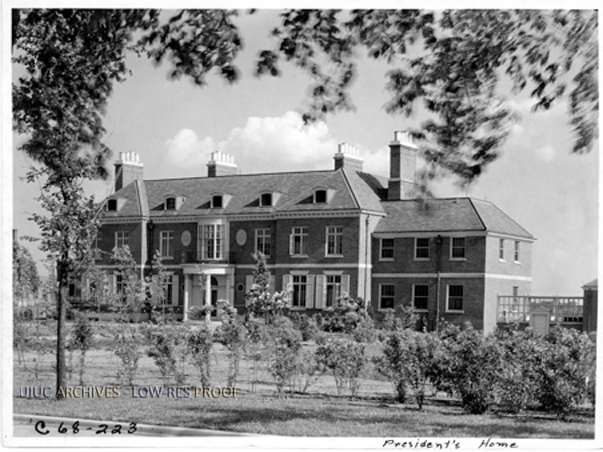 President's House, 1934: Image courtesy University of Illinois Archives. If you can help to identify the copyright holder, please contact the University Archives. 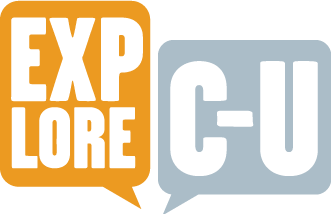 Caroline Bair, Michael Kuo, and Cora Scott, “President's House,” ExploreCU, accessed April 20, 2019, https://explorecu.org/items/show/274. University of Illinois. "President's House." Office of the University President. University of Illinois Champaign Urbana, n.d. Web. 16 Nov. 2013. <http://www.uillinois.edu/president/history/house/house_interior/>. "Campus Building Floor Plans." Division of Public Safety. University of Illinois Champaign Urbana, n.d. Web. 16 Nov. 2013. <http://police.illinois.edu/emergencyplanning/floorplans/>. Platt, Charles A. University of Illinois Buildings Designed by Charles Adams Platt: National Register of Historic Places: Multiple Property Documentation Form. Comp. Karen A. Sullivan and Kenneth M. Itle. 1999. Print Sullivan, Karen A., and Kenneth M. Itle. University of Illinois buildings designed by Charles A. Platt. N.p. : National Register of Historic Places Multiple Property Documentation Form, 1991. Department of Urban and Regional Planning, University of Illinois at Urbana-Champaign. Web. 16 Nov. 2013. <http://pdfhost.focus.nps.gov/docs/NRHP/Text/64500209.pdf>.